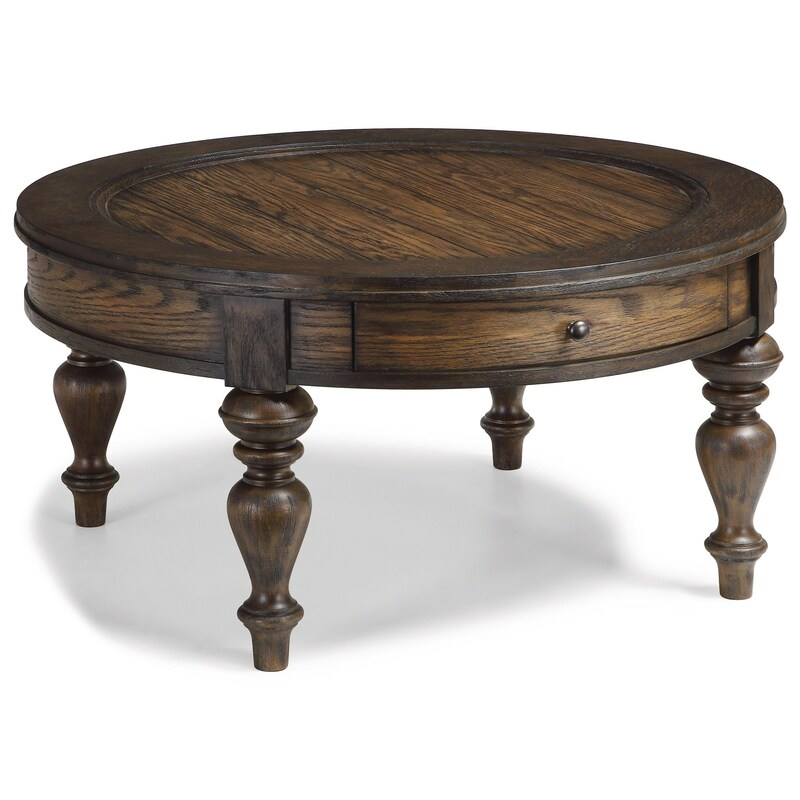 Complete your living room with this traditional style cocktail table. The coffee table not only features ample display space on its spacious tabletop but also brings concealed storage to your living room by way of a drawer. The storage of the piece is also matched by its timeless look thanks to a beautiful weathered oak two tone finish and elegant turned legs. The Bordeaux Traditional Round Cocktail Table with Drawer by Flexsteel Wynwood Collection at Zak's Home in the Tri-Cities, Johnson City, Tennessee area. Product availability may vary. Contact us for the most current availability on this product. Wood & Finish Two tone weathered oak finish. Handles & Hardware Drop drawer pulls use a classic design. Case Detail Elegant turned feet and beautiful moldings that frame each piece. Drawer Suspension Self closing drawers utilize ball bearing glides for smooth operation. Bring unique and beautiful style to your living room with the traditional style pieces of this collection. Storage pieces utilize self-closing ball bearing glides to provide smooth operation while a beautiful two tone weathered oak finish creates a timeless look. 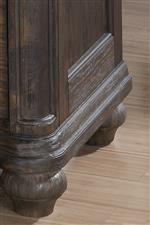 Each piece features elegant turned legs and intricate moldings to create a timeless look perfect for your home. The Bordeaux collection is a great option if you are looking for Traditional furniture in the Tri-Cities, Johnson City, Tennessee area. Browse other items in the Bordeaux collection from Zak's Home in the Tri-Cities, Johnson City, Tennessee area.